Mini Bluetooth Wireless Speaker for Music Streaming and Hands-Free Calling, Built-In Microphone, 3.5mm Audio Port, TF Card Slot, Rechargeable Battery for Indoor and Outdoor Use. 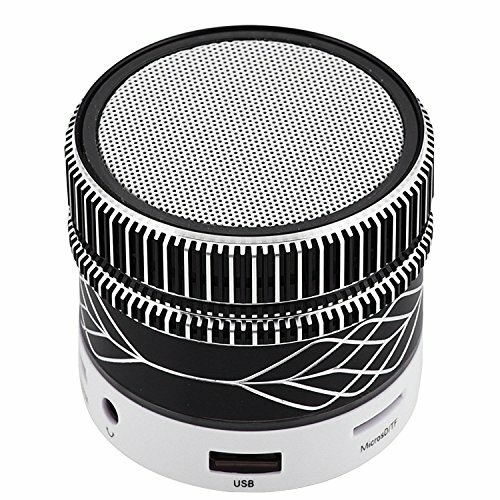 WIRELESS PORTABLE BLUETOOTH SPEAKER: It's easy to pair it with your bluetooth devices. Enjoy a high definition stereo sound with a great volume, whether you're lounging around the house,or partying,walking out,camping,hiking,biking, easy to carry. COMPACT MINI SIZE: Small, stylish, and extremely portable, fits easily into your bag or pocket so you can use it on the go. you also can put it on your desk in bedroom as a decoration and it will fill a bedroom with a good level of music. HANDSFREE CALLS FUNCTION: Built-In high quality microphone for handsfree speakerphone phone calls from smartphones and iPhones; connect in seconds to Bluetooth devices including: iPhone, iPad, iPod, Samsung, Smartphones, Tablets; play audio from laptops, PCs, and non-Bluetooth devices using included audio cable/AUX-IN jack; with Micro-USB port for charging. If you have any questions about this product by TopePop, contact us by completing and submitting the form below. If you are looking for a specif part number, please include it with your message. Portable Bluetooth Speaker,BOOMER VIVI Wireless Bluetooth V4.2 with Loud Stereo Sound, Rich Bass,Handle, AUX Audio, FM Radio, TF Card Input, Series 1+1 Mode Design for Phones, Tablets, Computers.